The Woman Today magazine welcomed more than 200 guests to the Greysolon Ballroom on Thursday, April 4, for the third annual Rosie Awards: Recognizing Women as a Driving Force event. 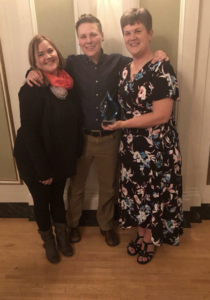 PAVSA Lead SANE, Alisha Blazevic was awarded the Silent Advocate Award. Pictured here with PAVSA SANE Jen Bauman and SANE coordinator Em Westerlund.